For Christmas I received a beautiful Santos and I love her...I've hung different necklaces around her neck and she looks wonderful with all the different stones around her...we have several different ones right now at the shop....I have seen very old beautiful churches filled with these interesting pieces. 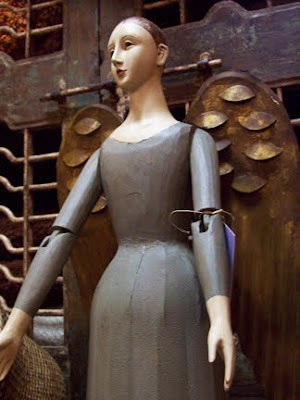 Santo (from the Spanish word meaning "saint") is a traditional New Mexican genre of religious sculpture. The word "santo" is also used to refer to individual works in this genre. Santos are carvings, either in wood or ivory, that depict saints, angels, or other religious figures. Icons and other religious images were crucial for the conversion of indigenous peoples to Roman Catholicism, which was itself an integral part of the Spanish colonization of the Americas. However, long distances, inefficient methods of transportation, and high demand for such artworks limited the ability of ecclesiastical authorities to supply parish churches, especially those in remote outposts, with "official" works of religious art from Spain. The first santos are thought to have been imitations of Spanish Baroque statues carved by priests. Later santos were influenced by native styles. They became popular items of devotion, found from home altars to churches, whence they sometimes attracted pilgrims. Originally common throughout Latin America and the Caribbean, the tradition of santo carving was preserved as a folk art in Northern New Mexico, whose isolated villages remain secluded to this day. Of particular note is the village of Cordova which has produced several well known santeros (carvers of santos), including George López who was awarded the National Heritage Fellowship by the National Endowment for the Arts in 1982. Santos carved in the round are commonly known as bultos. They are usually carved from cottonwood root, pine or aspen. A santero carves a bulto with a knife and then covers it with gesso, a mixture of native gypsum and glue, to prepare it for painting. Some contemporary santeros still use paints from homemade pigments.